The Leg continues as teams must now take a high speed train to Shanghai. But they must first take their little good luck Sinaorama plush, 4,500 Chinese Yuan on their BMO CashBack Mastercard and find the Sinorama rep outside the Beijing train station for their clue and tickets. Sam & Paul drop their train tickets and the Additional Info paper. They are able to find their tickets, but not the additional clue paper. They ask Adam & Andrea if they can copy the information in exchange for help later on. They agree. Once in Shanghai, teams must make their way to Tock’s Montreal-style Deli where they have to recite the phrase “xie xie ni” which they learned at the Great Wall to the Sinorama tour guide to receive their next clue. Karen & Bert arrive at the deli first and they open the clue telling them to fly to Bangkok, Thailand on Air Canada Thai Airways. Once in Bangkok, teams must head to the Caturday Cat Cafe for their next clue. But HOURS OF OPERATION! The cafe opens at 8am. At 8am, teams find their clues which include a Fast Forward. For this Fast Forward, teams must score one hoop takraw goal. All teams can attempt the Fast Forward at the same time. Only Kenneth & Ryan, Adam & Andrea and Korey & Ivana decide to go for it. But Korey & Ivana are taken to the wrong location and Kenneth & Ryan decide not to go for it after all. 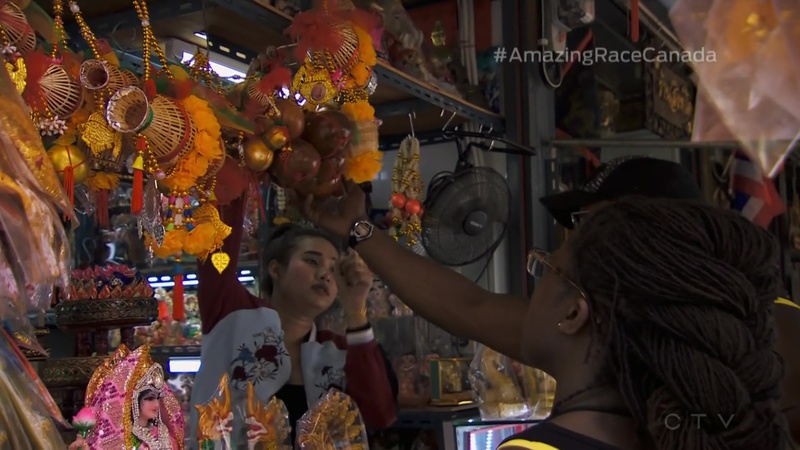 Adam & Andrea easily win the Fast Forward and can now head to the Pit Stop at the Wat Thewarat Kunchorn Worawihan Temple. Korey & Ivana arrive at the stadium just as Adam & Andrea leave. 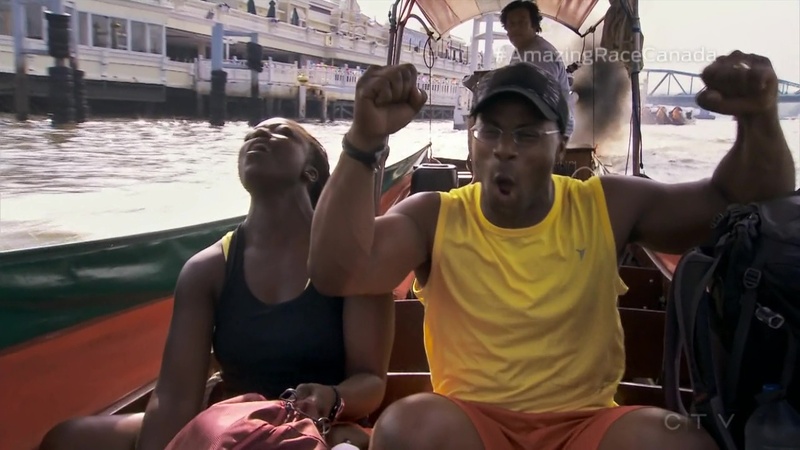 however, they actually get on a boat before Andrea & Ebonie and Kenneth & Ryan. The other teams instead must take a long tail boat to the Artist’s House by Wat Khuha Sawan Pier. 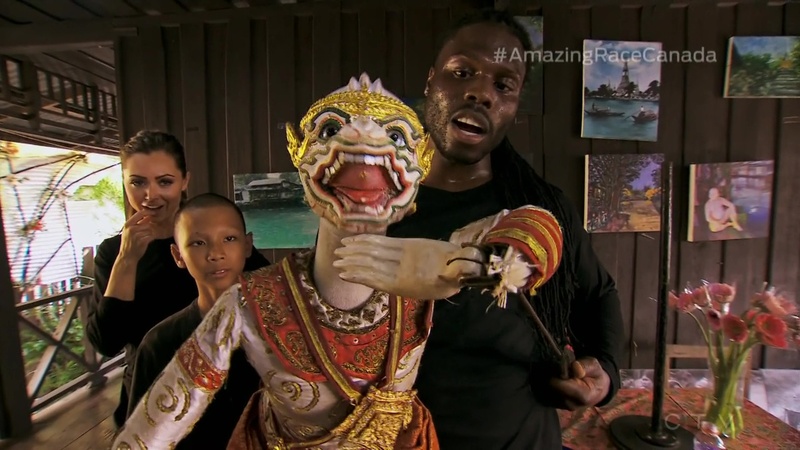 Karen & Bert are first to arrive and learn they must perform a traditional puppet show routine using a puppet of Hanuman. All the teams catch up at the Artist’s House. Sam & Paul attempt a performance first and they get the thumbs up. They open the next clue revealing the Detour: Bling It or Shred It. In Bling It, teams must compare two tuktuks and determine the identical decorations on both which they will then need to buy in the nearby Amulet and Klongthom markets to decorate their own tuktuk. In Shred it, teams must ride the waves at Flow House Bangkok and each team member must grab one flag. As Sam & Paul choose Shred It, Adam & Andrea arrive at the Pit Stop to officially check in as Team #1. They win a 14-day Sinorama package to Bangkok, Chang Mai, the Golden Triangle, Yangzhou and Shanghai. Back at the Artist’s House, Zed & Shabbir are next to attempt a performance, but they don’t realize that they are not supposed to talk during it. Korey & Ivana also fail their first attempt because they do not remain silent. Karen & Bert get the thumbs up on their first attempt and they choose the Bling It Detour. Andrea & Ebonie and Kenneth & Ryan are next to pass and they choose Shred It. Zed & Shabbir fail another attempt and that allows Korey & Ivana to pass them. Zed & Shabbir finally re-read their clue and realize their mistake. They finally get the thumbs up after their 9th attempt. Sam & Paul and Andrea & Ebonie grab their flags and head to the Pit Stop. They arrive at the same time. 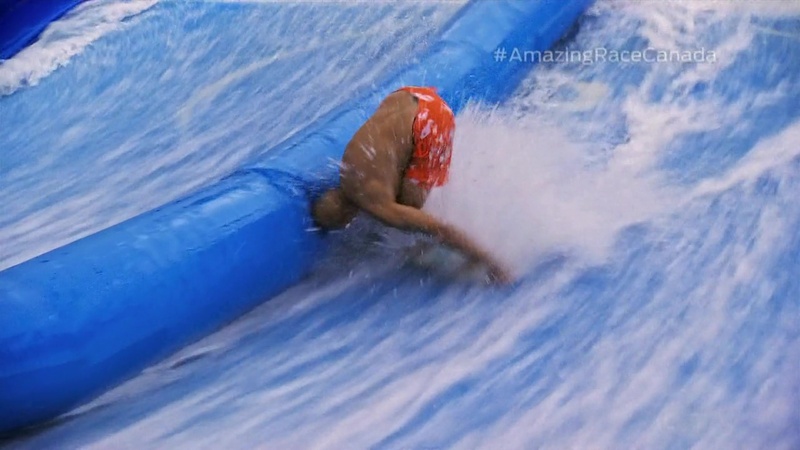 After Sam falls flat on his face, Andrea & Ebonie are able to just pass them to the Mat to check in as Team #2. Sam & Paul have to settle for 3rd. Kenneth & Ryan finish the Detour and head to the Pit Stop as 4th. Zed & Shabbir arrive at the waves. Zed has no problem grabbing the flag, but Shabbir is struggling. After one fall too many, they decide to switch Detours. Karen & Bert have a long distance to travel to buy their decorations as Korey & Ivana arrive and get started with the tuktuk Detour. Karen & Bert figure out what they are missing and head to the Pit Stop as team #5. Korey & Ivana correct their mistake and now head to the Pit Stop where they finish as Team #6. 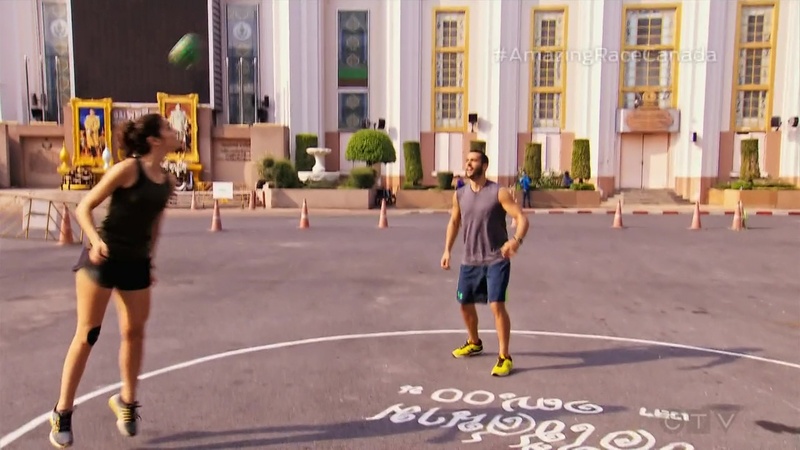 Zed & Shabbir finish the Detour and hope it’s a Non-Elimination, but it is not. They are last and eliminated. Again with the horrible faux drama at the end. lol It was obvious from Korey & Ivana’s comments and not even seeing Zed & Shabbir that they were far ahead. Anyway, I still think Shanghai should’ve had a full Leg. You’d think Sinorama would love to have three Legs of promo. Shanghai certainly has enough to do for a full Leg, especially if this is one SuperLeg in its most strict definition. 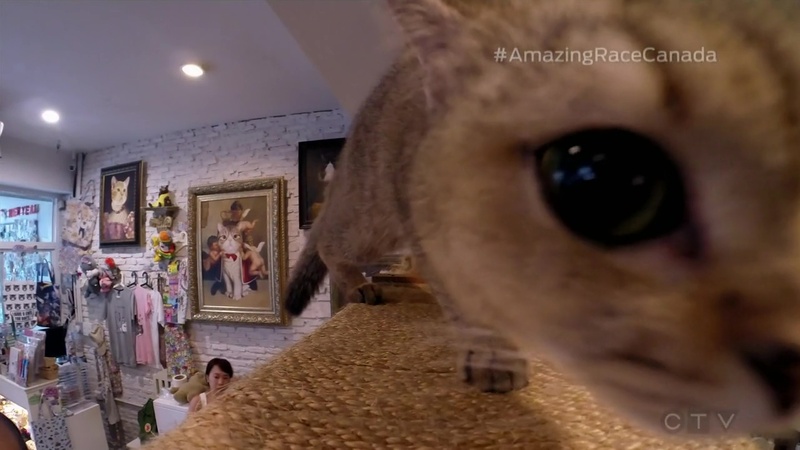 Then, of all the places in Bangkok, they go to the cat cafe again. Thai tourism must really want to promote it. lol It’s not like Canadian TAR fans haven’t seen that location before. If it were TARPH or TAR Vietnam, etc, a visit to the cat café would be new. But Canadians, I assume, would’ve already watched TAR26. The equalizers at the start of this episode were alright as I assume they really wanted an all-out, all-team battle at the Fast Forward. But it wasn’t meant to be it appears. Amusing though that TAR Canada didn’t make sepak takraw a Face Off. Though I’m certainly not sad we haven’t seen any inkling of a Face Off yet. I do like what they were going for on paper here anyway. The performance task was really great. A great cultural task with local interaction. And of course, an opening for teams to completely mess up as we saw. The Detour, however, was completely unbalanced. And I don’t just mean the balancing at the wave house. Even if the wave Detour had its challenges, the tuktuk Detour was a combination of several different tasks (attention to detail, assembly and shopping at TWO different markets). And that combination, even just on paper, already looks like such a long, tedious task. Especially compared to the surfing. Not even really a pros and cons Detour kind of thing. It was just unfair. What’s most unfair though is TAR Canada having a very nice local, cultural task with the tuktuk and pairing it with a very generic task that conceivably all teams could’ve chosen instead. Again, with international and cultural Legs at a premium on TAR Canada, they really go out of their way to be as generic as possible when it comes to tasks. (Car parts in Cuba, motorcycle assembly in Vietnam?) Though of course, it’s not exclusive to TAR Canada. TAR28’s Mount Ararat oil change is still a doozy. Anyway, the Sinorama package prizes are amazing. Those are some nice trips. I wonder where else Sinorama organizes trips to. I don’t care if it’ll be Asian countries again, as long as Sinorama can help TAR Canada 6 get some international Legs! What a horrible Leg for Zed & Shabbir. I was definitely rooting for them to go all the way, but they really struggled this Leg. Their biggest mistake of course is breaking TAR’s cardinal rule: READ YOUR CLUE. I think they would’ve survived had they stayed silent on their first attempt. It’s too bad. Korey & Ivana really have bad Race navigation luck. Like they said, they do well at the actual tasks, but getting to them is their struggle. They stumbled at the puppet task, but even then, they’ve done well otherwise. I definitely hope they can overcome that bad luck as the Race moves along. Andrea & Ebonie are continuing to do well. They’re continuing to prove they actually do have what it takes to compete without needing to take a penalty. Adam & Andrea also stepped up quite well to get that Fast Forward done. Maybe it’ll be a nice boost for them moving forward. Sam & Paul are also proving to be a strong contender. Karen & Bert are also doing well, but they should definitely step it up a little. Their performance at the Detour though was more on the Detour itself. Kenneth & Ryan were alright this Leg. Thankfully. And there are definitely no teams flying under the radar any more. ← Recap: Kamen Rider Ex-Aid, Episode 41 – Reset Game!